. In a recent blog post, we demonstrated how Google Cloud Platform can rapidly provision and scale networking load to handle one million requests per second. A fast front end without a fast backend has limited use, so we decided to demonstrate a backend serving infrastructure that could handle the same load. We looked at popular open source building blocks for cloud applications and choose Cassandra, a NoSQL database designed for scale and simplicity. go from nothing in existence to a fully configured and deployed instances hitting 1 million writes per second took just 70 minutes. A configured environment can achieve the same throughput in 20 minutes. All data presented in this post is using Cassandra Quorum commit (writes must be complete in at least 2 nodes), triple replication, and data encrypted at rest. With commit ONE Compute Engine was able to sustain ~1.4M writes per second, with a latency median of 7.6ms and 95th percentile of 21ms. However, for this post we wanted to focus on quorum commit which improves reliability. You can find the instructions on how to reproduce the results by following the setup instructions. In addition to looking at top end performance we also looked at resiliency. We removed ⅓ of the cluster nodes and it remained functional and serving more than 1M writes per second. Median latency held at 13.5ms, 95th percentile at 61.8ms, and 994.9th percentile at 1,333.5ms. We consider those numbers very good for a cluster in distress, proving Compute Engine and Cassandra can handle both spiky workloads and failures. Tuning the workload costs $5 per hour (on a 3 node cluster), and the minimal test required to hit one million writes per second takes 1 hour and 10 minutes at a cost of $330 USD when run in March 2014. Putting it all together, this means the Google Cloud Platform was able to sustain one million Cassandra writes per second at a cost of $0.07 USD per million writes. Google is known for creating scalable high performance systems. In a recent blog post, we demonstrated how Google Cloud Platform can rapidly provision and scale networking load to handle one million requests per second. A fast front end without a fast backend has limited use, so we decided to demonstrate a backend serving infrastructure that could handle the same load. 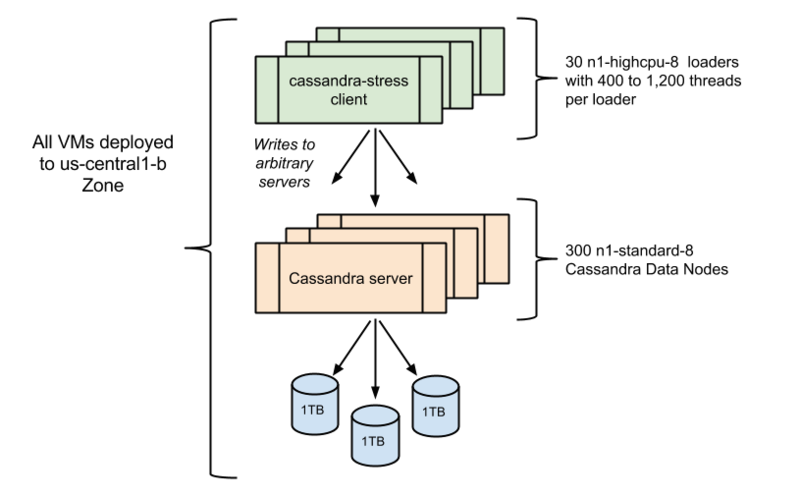 We looked at popular open source building blocks for cloud applications and choose Cassandra, a NoSQL database designed for scale and simplicity.